Apple first offered iChat in 2002, as part of Mac OS X 10.2 Jaguar. Though I’ve tried iChat repeatedly with various releases of newer versions of the Mac OS, I always end up abandoning the software for the free, open-source Adium instead. iChat has long had one major leg up on Adium—its built-in support for audio and video chatting—but other Adium features offered enough improvement over iChat that I considered Apple’s instant messaging (IM) tool an also-ran. The newly released Mac OS X Lion includes iChat 6.0. It’s the first iteration that really can rival some of Adium’s advances in the IM software space. That’s because iChat finally adds features it’s missed for far too long. iChat 6.0 in Lion finally adds built-in support for Yahoo's instant messaging service. For example, iChat 6.0 allows you to sign into the Yahoo instant messaging platform. The integration is complete: you see your Yahoo buddies’ avatars, availability, and current chat status. iChat already offered out-of-the-virtual-box support for the AIM, me.com, Mac.com, and Google Talk IM networks. The software also includes Jabber support, which means you can use iChat to connect to other IM networks—including Facebook Chat. Adium offers built-in Facebook support; iChat still requires that you configure Facebook Chat manually. 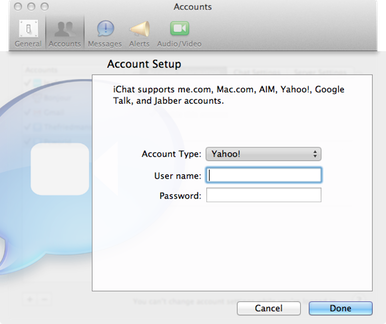 Even more welcome than the addition of Yahoo support is iChat’s implementation of a unified buddy list. Most of us don’t mentally organize our friends by which IM service they use; iChat’s former reliance on separating them that way made little sense. iChat 6.0 combines all your friends into a single list, which is an improvement, but still falls short in comparison to Adium. There’s no obvious way to distinguish which service a friend is logged into just by looking at your buddy list. (Adium can show a service icon next to each buddy’s name.) And if you have a friend with accounts on multiple services, iChat’s approach for combing your friends’ accounts into a single buddy entry on your list isn’t as intuitive as Adium’s. In Adium, you drag usernames on top of each other to merge them. In iChat, you must Command-click on each name, and then choose “Add to Address Book as One Card” from the contextual or Buddies menu. Do that, and you’ll lose any custom name you’ve given the contact (say, “John Smith” instead of “jsmith88”), requiring you to edit it all over again. Type Command-F, and then start typing the name of the buddy you're after. Managing your bigger-than-ever buddy list is easier in iChat 6.0. The app now supports a unified status; you set your status once, and it updates all the services you’re using. And if you press Command-F, or choose Edit -> Find, you can filter your buddy list by typing all or part of the name of the person you’re looking to chat with. 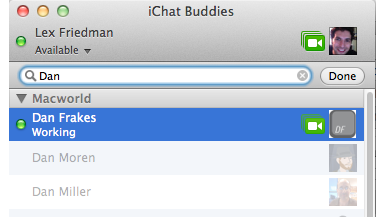 iChat now makes it easier to add a photo to your IM buddies: You can choose from your iPhoto faces. If you frequently chat with lots of separate folks simultaneously, you’ll appreciate that iChat 6.0 also lets you drag chat tabs out of the main window into windows of their own, and merge chats together by dragging them onto each other. Those are nice new features for iChat to introduce. Some interactions that iChat still clings to, however, are head-scratchingly odd. I refer, of course, to the “Accept” paradigm: Whenever you receive an IM to start a conversation—that is, an IM from someone with whom you aren’t currently engaged in an active chat window—iChat pops up a new window, asking you to approve or reject the initiated conversation. It’s annoying, and iChat’s employed this bizarre behavior for as long as I can remember. I can’t use iChat at all unless I take advantage of this old Macworld hint for automatically accepting incoming chat invitations. There’s one other area where iChat pales in comparison to Adium. The biggest benefit Adium adds to my daily workflow is that I can keep tabs on my incoming messages without incessantly switching back to the app. Thanks to its Dock notifications (which can include the name of the person sending you IMs) and Growl integration (which can display the text of incoming messages in floating palettes atop your screen), Adium lets you know who’s saying what without interrupting your work. iChat still relies on a mostly useless Dock icon bounce, with no other information provided about incoming messages unless you navigate back to iChat’s window. That approach simply doesn’t mesh with my approach to multitasking. Less annoying, but still odd: When you type messages in iChat, Lion’s iOS-style autocorrection feature doesn’t seem to work. Of course, iChat does pack in one massive advantage over Adium: excellent audio and video chat support. In Lion, iChat supports full-screen mode when you’re video chatting, which works great. If you swipe away from the full-screen video chat to another screen on your Mac, the call continues. (That’s in contrast to FaceTime’s full-screen mode, which places your call on hold.) I find iChat’s video calling often works quite well. In my experience, sometimes I can get better call quality with iChat, and sometimes things are better in Skype. iChat has long made video conferencing (and screen sharing) ridiculously simple, and that continue in Lion. You can even use to the new silly Photo Booth effects as you video chat, if you’re into that sort of thing. Apple first introduced FaceTime for Mac late in Snow Leopard's tenure. Back when the desktop edition of Apple's iPhone and iPad video conferencing technology was introduced, some of us wondered whether the FaceTime app would one day merge with iChat. The answer from Apple has thus far been a resounding “no.” Lion's incarnation of FaceTime—version 1.1—doesn't differ much from the Mac App Store version of the video-conferencing tool for Snow Leopard. In fact, the only notable change between the version in the Mac App Store and the version included with Lion is the introduction of support for Lion's full-screen mode while video chatting. FaceTime and iChat are two different beasts. FaceTime still only works for video chatting; you can't use the software for sending instant messages or audio chatting. And FaceTime—unlike iChat—lacks any notion of “online now”: You can't know if your contact is available until you try to place the call. On the plus side, FaceTime lets you place calls not just to other Mac users with the software installed, but also to late-model iOS device users as well. iChat 6 is unquestionably the best incarnation of iChat to date. But I can’t help but notice that iChat often feels a bit out of place in the Apple app ecosystem. With other stock Apple software—Mail, Safari, iTunes—you have other options, but Apple’s apps clearly and aggressively compete with their alternatives. It seems that Apple doesn’t view Adium as a competitor, though, and that’s a shame: For all of iChat’s achievements, particularly in regards to video chat, its basic interface lacks well-defined niceties that could make the iChat experience far superior to what it is today. Lion's version of iChat is the best implementation of OS X's built-in chat client to date. But it still lacks the features of third-party instant messaging clients.